Tube winding is a very old technique and was practised hundreds of years ago to manufacture bullet cartridges and fire works. In those days, and in some cases even to be found today, paper sheets were wound convolute around a wooden stick and glued at the edge. More than 100 years ago, the first tube winding machine was designed, based on this manual procedure. 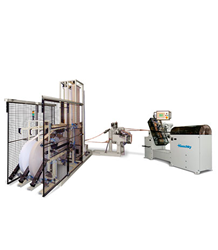 Since convolute tube winding was very slow and could only produce one tube at once, a process was searched for a long time to run this intermittent procedure continuously as for example in an plastic extruder. A further advantage of such a method is that the tube can be supplied of practically endless lengths, instead of one determined length. The tube is then be cut-off, according to need, at various sections. The solution is called ‘Spiral Winding’. 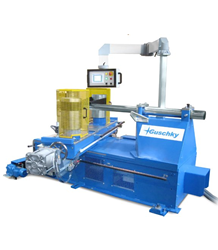 Guschky is manufacturing such spiral tube winding machines since 1950. 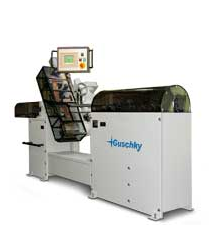 More than 1000 installations have been supplied up to now throughout the world. Small tubes of a few millimetre in diameter as well as large volume barrels can be manufactured on spiral winding machines. There are tubes with only two paper layers, but also some with 25 mm of wall thickness, means i.e. 40 plies. 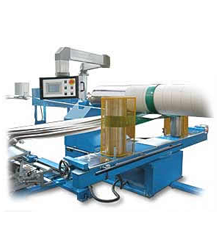 The diameter range can be between 5 mm and up to 1.5 m.
The cut-off length can be 10 mm, as for a roll of adhesive tape, or over 10 meters, as for winding cores needed in paper mills.